The olive cottage is situated on the left side of the property. Quiet and very well equipped, 80 m² consisting of a living room with a large fireplace, open kitchen offers American-style, two bedrooms of 2 persons and a sofa bed and a bathroom with shower and bath and toilet. This cottage also features a beautiful covered veranda where you can watch the sun rise in the quiet of the early morning. A covered outdoor summer kitchen with a stone barbecue and an open terrace where you can lunch or dine peacefully complete the picture. 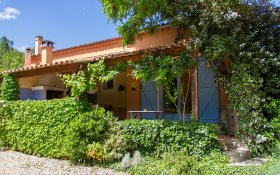 Located in the main building, this cottage of 76 m² as a typical indoor fireplace Provencal kitchen, a bedroom on the ground floor, upstairs another bedroom and a living room with sleeping area. A beautiful bathroom with bath and shower will allow you to take your ease in this cottage in a cosy and inviting atmosphere to cocooning. Your terrace, your barbecue too of course await you to share appetizers and meals in a friendly atmosphere. 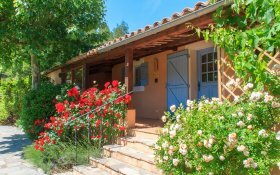 Studio of 35 m² located on the ground floor overlooking the prairie and the forest, furnished with "Provencal" style will fit all lovers of nature. A kitchenette equipped with a large bed for 2 persons and a bed-settee for 1 child will be at your disposal. A beautiful room with bath tiles in blue and white, a private terrace will complete the equipment of this cottage. You also have a stone BBQ for your evenings grilling. Located in the main building, with this old cottage from 1858, this is 150 m² that ou will have at your disposal to reunite your family during your summer or winter vacation. A beautiful terrace in the shade of the 80 years old vine, a stone barbecue, a beautiful garden furniture perfectly suit you to share your meal and libations. 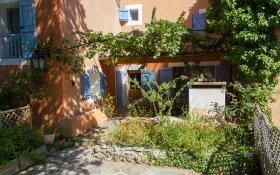 will complement the equipment of this cottage which was the former accomodation of the estate’s winemaker (maître de chai). 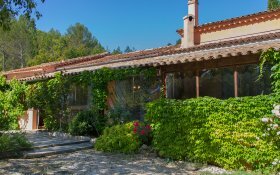 Furnished with great care in a rustic Provençal style, this cottage of 60 m² will make you forget your everyday worries. Its open kitchen, the lounge with its fireplace, terrace with view on the swimming pool will allow you meet you at 2 or 4 in this cozy nest. This cottage also has a private terrace side course, equipped with a kitchen summer and a stone barbecue. Do you have a big family ? 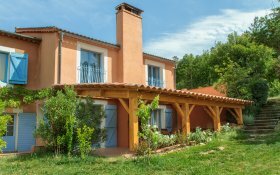 We have the solution for you with our Cottage le Romarin. 110 m² composed of a large living room - dining room, a kitchen, 3 bedrooms for 2 people and a sofa bed (in the lounge) this cottage will certainly agree you. A large bathroom with bath and shower and a bathroom with shower and 2 toilets complete the features of this space furnished with taste and refinement. 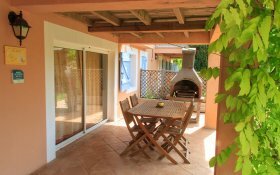 A large private terrace with a fireplace - outdoor barbecue allows you to enjoy the fresh air of Provence. 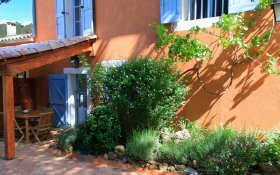 The cottage du Thym is situated in the middle of the property, quiet and tastefully, it welcomes you with its 95 m². It has its own private terrace on the side of forest and a covered veranda overlooking the forest and the pool. It is equipped with an indoor open kitchen with all the comforts. 3 bedrooms, each 2 persons and a lounge equipped with a sofa bed complement its interior design without forgetting its beautiful indoor fireplace and a dining room. You will also find outside on the terrace, a summer kitchen of hotplates and a stone barbecue. The Estate La Réparade welcome you all year round, located in the heart of green Provence in the village of "Châteauvert". 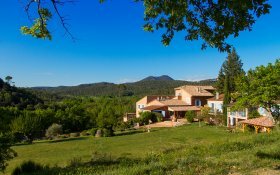 This beautiful area of 45 hectares of forest is 45 minutes from Aix en Provence, Marseille or St Tropez. We have 7 cottages 4 * stars at your disposal for your events private. Birthdays, get-togethers, between friends, weddings and baptisms on weekends. Our cottages range from the Studio for 2 persons in the apartment for 12 people. A weekend with your loved one? A gift to your loved one? 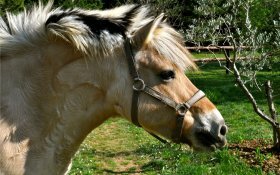 We offer you this Horse-riding weekend, to reconnect with the Provencal nature and discover the beauties of the region under a different and original angle. Whether you are confirmed or beginner riders, all formulas are available to allow you to spend a great Weekend! According to the number of persons, we welcome you in one of our Cottages 4 * star. You can visit the region in the company of a State qualified instructor who will show all the subtleties of the walking horse and ask for the regional flora and fauna. We offer several flexible formulas according to your desires and your riding level. A gift to your loved ones? We offer you a discovery wellness Massages weekend, to reconnect with relaxation, calm and the Provencal nature. Discovery workshops family aromatherapy and massage-well-being.